Fossil remains of a salamander-like amphibian, which was the size of a car and lived during the rise of the dinosaurs, have been discovered in Portugal. 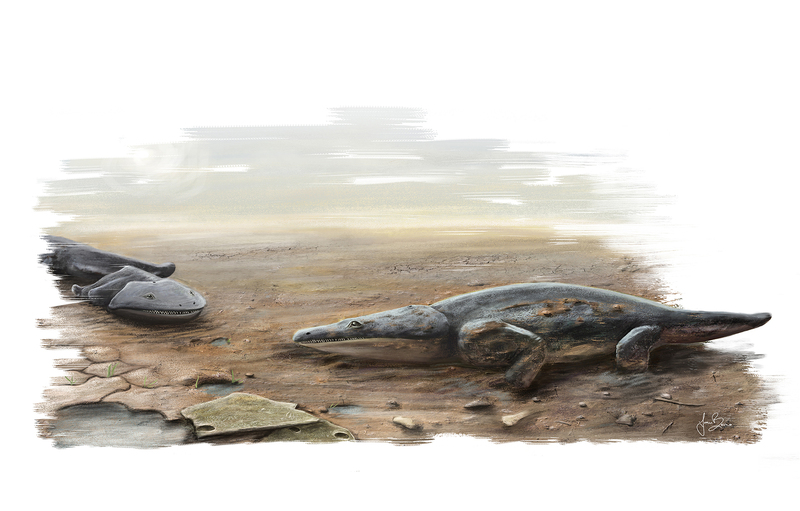 Writing in the Journal of Vertebrate Paleontology Tuesday, researchers described how this 7-foot-long amphibian was much more threatening than modern salamanders. With a mouthful of razor-sharp teeth, it would have been more like massive crocodiles prowling lakes for fish some 220 million years ago, during the Late Triassic Period. "This new amphibian looks like something out of a bad monster movie," Steve Brusatte, the study's lead author from the University of Edinburgh's School of GeoSciences, said. "It was as long as a small car and had hundreds of sharp teeth in its big flat head, which kind of looks like a toilet seat when the jaws snap shut," he said. "It was the type of fierce predator that the very first dinosaurs had to put up with if they strayed too close to the water, long before the glory days of T. rex and Brachiosaurus." Richard Butler, another author on the study, from the School of Geography, Earth and Environmental Sciences at the University of Birmingham, concurred. "Most modern amphibians are pretty tiny and harmless," he said. "But back in the Triassic these giant predators would have made lakes and rivers pretty scary places to be." Fossil remains of species belonging to this group of extinct amphibians called metoposaurids have been found in parts of modern day Africa, Europe, India and North America. Differences in the skull and jaw structure of the fossils found in Portugal revealed they belong to a separate species named Metoposaurus algarvensis. This species is the first member of this group to be found on the Iberian Peninsula. It thrived during the time of the dinosaurs, which lasted for over 150 million years, and is a distant relative of modern amphibians such as frogs and newts. The amphibians' demise came at a chaotic time on Earth, when climates were changing, just before the supercontinent of Pangea began to unravel. The breakup of Pangea coincided with the Atlantic Ocean rising and eventually led to the extinction around 200 million years ago of many groups of vertebrates, such as big amphibians. That paved the way for dinosaurs to become dominant. Brusatte said the fossils could shed further light on a time "that was very different from today with the supercontinent and a much hotter climate." It also could help scientists understand the breakup of Pangea, which sparked massive volcanic eruptions. "It didn't just break up overnight. It took tens of millions of years and it broke up along the margins of the Atlantic Ocean today," he said. "Portugal is right on the edge of the Atlantic so these guys would have been living right in the middle of this rift." Brusatte said he had heard reports of the fossils at a site in Algarve, an area in southern Portugal best known for its beaches. Once the team started digging, Brusatte said he quickly realized the area was a site where many of these salamanders had died. "We found a lot of fossils on the ground and so we traced those fossils up to a layer of rock that was half a meter thick that was just full of bones," Brusatte said, adding they have so far they have recovered 10 skulls, parts of shoulder girdle, backbone and parts of a hind leg. "It was a mass graveyard of these big amphibians," he said. "It is just a really interesting site where you have hundreds, maybe even thousands of these big, 6- and 7-foot-long giant salamander things." Brusatte said he believes some "catastrophic event" caused this mass die-off in Portugal. The most likely scenario was some kind of dramatic climatic event that caused the lake or pond where the amphibians lived to rapidly dry up. "If the pond dried up, it would have been not so good for these guys. They are amphibians and amphibians need to live near water," he said. "These guys were really big, pretty heavy and didn't really have strong legs so they probably couldn't move that easily on land. If their lake or pond dried up, they were in serious trouble." Randall Irmis, a paleontologist from the University of Utah who wasn't part of the study, said the finding "will improve our understanding of the biology" of metoposaurids. "It's great to see a new species discovered from a part of Europe where we previously had very few fossils," Irmis told CBS News. "It's also exciting that they have found so many different individuals. This will provide insights into how the animals grew and changed during their lifetime, what variation there might have been in the population, etc."